Shawnta S. Barnes works in Indianapolis for the Metropolitan School District of Wayne Township as an elementary library/media specialist and for Marian University as an adjunct professor. Previously, she has served as an elementary and high school literacy coach, a middle and high school English/Language Arts teacher, and K-5 English as a New Language teacher. She is also an education writer for Indy K12, a publication under the Citizen Education network. Superintendent Dr. Jeff Butts was recently named the 2019 Indiana Superintendent of the Year by the Indiana Association of Public School Superintendents (IAPSS). He is the superintendent of the Metropolitan School District of Wayne Township, a school district on the west side of Indianapolis. He will represent Indiana in the National Superintendent of the Year competition. Recently, I had the opportunity to have a conversation with Dr. Butts about his role as superintendent and his views on education both locally and across our nation. Note: Interview was condensed and edited for length and clarity. Shawnta S. Barnes: What do you believe is the greatest threat to improving our education system? Dr. Jeff Butts: I believe the greatest threat is the narrow rails we put up in our accountability system. Anything we measure will determine what gets taught and what gains focus in our classrooms. I think when we narrowly define what success looks like inside the classroom, we do our students a great disservice. I also think to some degree we have severely limited what our teachers are able to do in the classroom by having significant state and federal oversight in much of what we do. We don’t allow our professional educators enough latitude to do the very thing they have been trained to do, to work with our students and to make adjustments and adaptations on the fly based on what is happening inside their classrooms. In conjunction with that, we do not respect educators enough; we don’t give them the respect they are due. There is way too much rhetoric out there that is negative against our school teachers and the hard work they are doing every day inside of the classroom both during the school day and outside of the school day and inside of the school year and outside of the school year. You can drive by our schools on any weekend or any holiday and you will see a parking lot full of cars. When teachers leave the classroom, they carry a heavy bag of stuff. Teachers are dedicated. We need to increase the level of respect we have for our teachers, we need to trust them to do the right things in the classroom, and we need to take down the narrow walls that we have for what students should be learning. SSB: One of the biggest challenges a superintendent faces is staying connected to the classrooms they are serving. How do you stay connected? 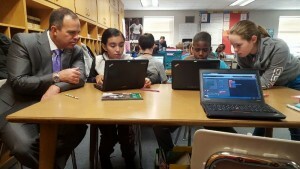 Dr. Butts: I think there is only one true way to stay connected to the classrooms and that is to try to be in the classrooms as much as you can. I will tell you that I am as guilty as anyone of not being in our classrooms. When a superintendent’s district gets larger or has more students, it gets more and more challenging to be in classrooms. I say that knowing that almost every superintendent I know began as a teacher. We all got into this line of work because we love children and love being in the classroom. Over time, we have matriculated through various chairs to get into the superintendent position. With each step that you take, you remove yourself one step further from what happens on a day to day basis in the classroom. Be in the classroom and see what is going on. Have an open and honest dialogue with teachers about their experiences and even their perceptions. Teachers operate in their classrooms and their buildings and sometimes don’t have the full grasp of some of the other systemic things that are going on from a district level that I might be able to provide some context. Listen to our students and get their perspective to hear what is going well and what they don’t like. It is a challenge and you have to be intentional. It is easy to become separated from the real work that is happening inside of the classroom. SSB: What advice do you wish you would have known before you stepped into this role? Dr. Butts: Every superintendent has a shelf life. I don’t know if any of us know what that shelf life is until we get there. It might be five years. It might be ten. I know a superintendent that has been doing it for 50. There’s a wide range. Some of it has to do with the circumstances in which you are leading, the community that you live in, and the board that you work for. All of those things play into how long that shelf life is. It is a very stressful job. It is a 24 hour a day job. It is a 365 day – and as one student reminded me – and a quarter day a year. It’s seven days a week. It is a job that you never shut down. Every single thing that happens in your district is your responsibility. As a superintendent, you can’t know everything and you can’t do everything. You have to rely on the people that you work with and you have to entrust them to do their job. You have to be able to communicate your vision well enough that they can go out and do their work within that vision. They have to help you establish your culture. There are districts where I have a great respect for the leader but I know the people that work for that leader may not be communicating or developing that same culture in the district and the district no longer reflects the leader. Your shelf life diminishes greatly if you don’t have people you trust and if you don’t trust the people you have. SSB: You are active in policy in Indiana. We were even in the same ESSA working group two summers ago. With Indiana Superintendent of Public Instruction Dr. Jennifer McCormick recently announcing not seeking reelection, would you ever consider becoming the state superintendent? Dr. Butts: I have the utmost respect for Dr. McCormick. I’m glad that she was able to make an announcement on her own terms. While I know that the next two years is going to be challenging because the sharks are going to be circling; the blood is in the water now. I do believe that she is really going to be able to advocate for some things that she might not have been otherwise because of political correctness and working through the channels that exist at the statehouse. I don’t know if she will see more or less success than she has in her first two years, but she has been a tireless advocate for our children and for what’s right and what’s best for students and staff. I believe she has fought for the right things and her 2019 legislative agenda is aggressive. I believe that it really speaks to where her heart is with public education. I – I won’t say we – I will do what I can to help support her in the things that I also believe in and believe are best for Indiana’s children. With that being said, I have found a great fit in the MSD of Wayne Township. I work for a wonderful board of education and I do not have a desire to and do not have any aspirations for political office. My position is political enough. SSB: There are 11 school districts in Indianapolis. Wayne Township allows students who do not live within the boundaries to attend schools in the district. What sets Wayne Township apart from the other schools in Indy and why should families enroll their children in a Wayne school? Dr. Butts: It is interesting when you are looking at a large metropolitan area that you have 11 school districts. In most metropolitan cities across the country, you have very large districts of 100,000 plus children. When we had Unigov under then-Mayor Lugar one of the things they tried to tackle was the school districts, but the local boards and the local community said we are not going to allow that to happen. Unigov was successful to some degree but it did not consolidate all services in the city of Indianapolis. When you think about the individual school districts in Marion County, every one of them has their own unique footprint in our community. I think to some degree each one of those townships reflects the community in which it is located which is part of the reason those communities didn’t want to consolidate. The west side of Indianapolis has always been a blue-collar, hard-working, family-oriented side of town with great pride. Our district reflects that demographic. We have individuals who have been here for generations and we have individuals who have moved here within the last couple of days. You get this wonderful blend of old and new. The demographics in our schools do not reflect the demographics in our community. We have a much more diverse population in our school houses than we have living in the broader community of Wayne. It becomes incumbent upon us to make sure we are sharing our story. If we don’t share our story with 75% of our residents who do not have children in schools then we can’t possibly help them understand why Wayne is so special. They won’t understand why it is important for us to open up our boundaries to 900 children who don’t live here and why they need to be proud of the schools that are in their community and quite frankly that are working to increase the property values of their homes. Part of what we do well is to work with individual students and families wherever they are, whatever their situation is, and however, they come. We make sure that we give them all of the opportunities they need so they can attain one of three things upon graduation: to enroll, to enlist, or to employ. What our ultimate goal is to make sure they can do any one of those three when they walk across that stage with that diploma. It is also important for us since we have 78% of our families who currently live in poverty that we break the poverty cycle in one generation. That means that we need to help our first-generation college students and our students who do not come from many financial means to never make that a barrier and help take away the financial piece as a constraint. We give them the tools they need to have experiences in the classroom and experiences outside of the classroom to be able to apply and attend college and hopefully graduate and go off and improve their opportunities. SSB: Some educators do not live in the district where they work. Why is it important for you to live in Wayne Township? Dr. Butts: That’s a really good question. I have had conversations with other colleagues who do not live in their district. I think it is important to live in my district because the decisions I make or the decisions I ask the board to make are impacting me personally. They impact where I live. They impact the value of my home. They impact the children in my neighborhood. They impact my quality of life. I believe that if I am going to ask one of my neighbors to do something like pay more taxes through a referendum that I also need to have that same impact on my personal finances. Secondly, I think it is important, as challenging as it may be, for my community to see me in lots of different ways. Most people see me in a shirt, tie, and suit at an event doing my official duty, but my neighbors see me in shorts and a t-shirt mowing my lawn or raking my leaves. Many of my neighbors will see me shopping at the grocery store, going out to eat with my wife, or running down the road as I am working out. I think that becomes critically important. That also means that on a weekend when I’m involved in a community activity, whether I’m in an official capacity or whether I’m enjoying it for the sake of being a community member attending something, people get to see me in that light. That helps them to relate. It helps them to get to know me as a person as well as that guy that’s the superintendent and it also makes me a little more approachable. There are times that I just want to be a guy. I just want to go to the fair and get a corn dog and a lemon shake-up and ride a ride or play a game. There are people everywhere and they are always watching. SSB: You seem to enjoy dancing. You danced during opening day and even participated in the Kiki challenge. Will we see you dancing in another video soon? Dr. Butts: You never know when the cameras are out and when people are filming. We try to do something fun every time we do opening day. We’ve done plays, we’ve done dancing, and I even have sung a solo one year. I try not to take myself too seriously ever and it is important for me just to be real. It is important for me to stay grounded. If you don’t remain grounded, it is easy for you to get pretty full of yourself and to believe you are a lot more important than you are. When a student from our student publications says, “Hey Dr. Butts. Will you do the Kiki challenge?” I say, “Sure.” I went to the journalism class and I thought these people are jumping out of the passenger’s side. They said, “You got to get out of the driver’s side.” That changes things a little bit. I said we are going to go to this enclosed area up here in the football field and we are going to make sure no cars and people are around. In doing that, I had to be cognizant of the perception that people would have. I got some negative feedback that I was promoting something that was unsafe – people jumping out of a moving vehicle and dancing. No good deed goes unpunished. With opening day, I think it is important – and the reason I have all of the administrators join me – for us to be vulnerable and to first have fun. Everybody loves to see their administrator being a fool. None of us can dance, but we’re up there trying to do whatever the latest dance move is. Everybody is having a good time and it sets the tone for the year. It’s a great way to say let’s have a good time this year. Let’s enjoy what we are doing. We are okay making fools of ourselves because we are just people. I think that really does take down the guard for a lot of people and makes us more approachable. Now that we have done it for nine years, people are always wondering what we are going to do. Quite frankly, I’m starting to get concerned that I can’t one up myself. You never know when I will be out there on video preferably one that I have chosen to participate. You can check out Dr. Butts’ dance moves in the videos included below. 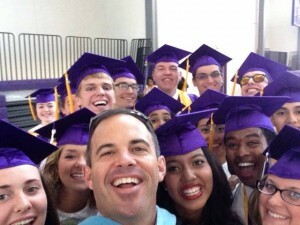 If you want to learn more about Dr. Butts and the happenings in the MSD of Wayne Township, you can follow him on Twitter @WayneTwpSuper or click #WeAreWayne.